I made this potato and plantain frittata from our dinner of leftover boiled potatoes and plantain eaten with palm oil tomato stew. You will sure love this stew if you haven’t tried it…the scent leaves takes it to another level. 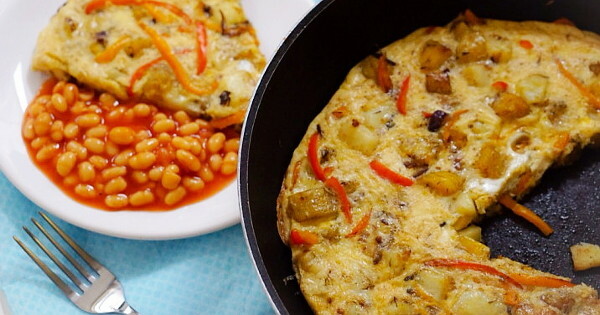 This yummy frittata will make a filling and nourishing breakfast, while ensuring food is not wasted. The plantain gives a subtle sweet taste to the dish and while it can be eaten alone, you can also pair it with some other foods like sausages, baked beans, jollof rice etc. You can save yourself the morning stress by boiling your potatoes and plantain the night before, in case you don’t have any leftovers to use. 1 seasoning cube or other powdered seasoning of choice. Put frying pan on medium heat and pour the oil. Once hot, add onions and peppers, then sauté for a few minutes. Add the diced potatoes and plantain, together with the seasonings. Stir fry for about a minute or two on low to medium heat, stirring to stop it from burning. Spread the stir fry mix evenly on the pan and then pour the beaten eggs over it. Allow to cook and set over low heat, covering the pan to make the heat get the top done. If you have an oven and using an oven-proof pan, you can reduce cooking time by putting it in the oven to cook. Can yam be used alone in place of potatoes and plantain?? ?